Although we talked over seven years ago, the effects of our conversation still remain fresh in my mind. It was a bright summer day and she just couldn’t stop laughing. When I asked about the reason for her insatiable joy, she explained that it was from watching a television show that was hosted by Henry Louis Gate Jr., where a few African-American participants who strongly believed they had Native American ancestry, took a DNA test and found out otherwise. Basically, the woman thought the show was humorous, as it proved once again that the so-called African-American got their facts wrong. Wait a minute! Are my ears deceiving me? You mean to tell me that in this day and age the African-American still finds himself as the main character in a historical minstrel show? Where they test a few African-Americans and all of them “coincidentally” just happen to come up negative?!! I wonder how long the television show Finding Your Roots would last if they were to conduct the same experiment among a group of Europeans claiming Jewish ancestry? After spending a few days crying in the solitary moment of our modern misconceptions, I knew for certain that this segment of the Finding Your Roots series was purposely aired to perpetuate an old myth. First of all, Henry Louis Gates Jr. cannot scientifically determine if an African-American doesn’t have Native American blood flowing through his veins. How so? Reason Number #1: A DNA test will only confirm whether or not you are related to any of the “federally-recognized” Native American tribes. There are dozens, if not hundreds, of federally-unrecognized tribes, whose roots in American go back thousands of years. Their status doesn’t mean that they aren’t indigenous to this land, it just means that they refuse to organize themselves in a manner in which the federal government approves. So basically, the same “government” that is responsible for the genocide of America’s First Nations are also the same ones that determine who is a certified Native American or not. Okay, I see where this is going. 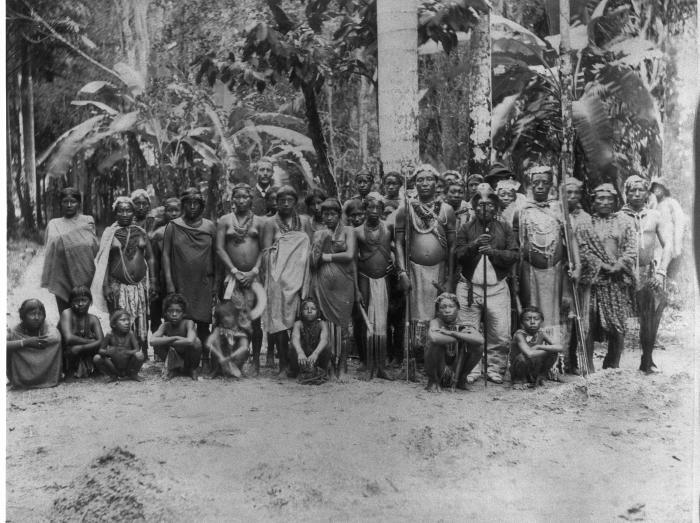 Arawak people audience with the Dutch Governor in Paramaribo, Suriname, 1880. Reason Number #2: A DNA test will only propose matches of existing populations, but does not determine the “history” of these populations. Let’s just keep this simple. Just imagine if the religion of modern science was to create a theory that Mexicans were Africa’s oldest and original people. Basically, in order to be considered a “Native African” your DNA would have to match that of a Mexican. Now you have this baffoon on television with a few African-American families, who believe they are of “Native African” ancestry, telling them that they are not, as their DNA does not match with the Mexican people. While this example may appear laughable it does help us illustrate an ancient American truth. “The same events, again, before referred to with regard to the causes of migrations, must be expected to have arisen in all parts of the world; and as we have contended that the main body of the American Indians proceeded from Asia, though admitting the probability of some of them being associated with descendants of stray Europeans, we may, on the same grounds, assent to the probability of some African nations or tribes also having found their way across the Atlantic, to mingle their race and languages with the people they might happen to meet there. According to the observations made by these members of British diplomacy, as cited above, the Americas were populated by Africans before colonial times. Let’s say for example that soldiers from the African nation of Mali settled in the Americas centuries before Columbus. They had children and remained true to their tribal customs. Later, their descendants were sold into slavery upon the arrival of the colonialists. Yet, these descendants still remember the stories of their forefathers. Today, they are proud African-Americans, who are firmly convinced that some of their ancestors were Native Americans. So they decide to take a DNA test and of course the results are negative because the test centers around certain tribal history, not the African natives’ history. The DNA test would indicate that their ancestry was indeed African like their Native American ancestors that originated from Africa, not their Mongoloid neighbors of the same soil. Now look at the history that is blotted out by these conclusions. The Native American DNA test excludes the genetics of the Black Native American populations. So any of their descendants cannot be confirmed by DNA testing. So who’s really lying? And this is why Henry Louis Gates Jr. is not in the position to tell, or should I say embarrass an African-American on television by informing them that they are not of Native American ancestry, while he sits there with a big grin on his face as if he’s the finalist in America’s Best Bearded Clam Parade. Reason Number #3: There exists an intentional deception to keep African-Americans away from honoring their Native American ancestors. Like every other ethnic group that claim to have a special relationship with the Creator, the Cherokee Nation has recently fallen under scrutiny for expelling its members who possess African ancestry. Why don’t we ever hear of such dramas occurring amongst people of European descent who claim Native American ancestry? Anyone pursued additional theories besides those that supported the crossing of the Bering Strait would find themselves without a job. later, Smithsonian under the influence of Hrdlicka’s “tyranny” would promote the amalgamated Amerindian as the oldest inhabitants of the western world. Happy Thanksgiving Henry Louis Gates Jr.